Route 66 was created to get people from Chicago to Los Angeles. 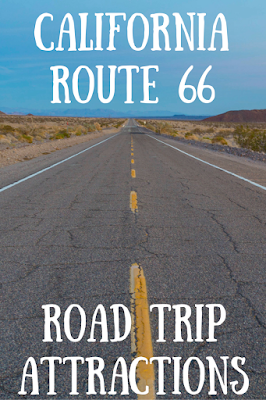 Route 66 was a popular road trip route in the 1950s, but with the creation of interstate highways, Route 66 became obsolete and the towns along it couldn’t survive being bypassed. While Route 66 went all the way to Los Angeles, following the original Route 66 through western California is pretty impossible. However, there are long stretches of California’s Route 66 in the eastern part of the state, especially between Victorville and Needles. We decided to start the New Year by celebrating Route 66’s 90th anniversary with a short Route 66 road trip and drove as much of California’s remaining Route 66 route as possible. 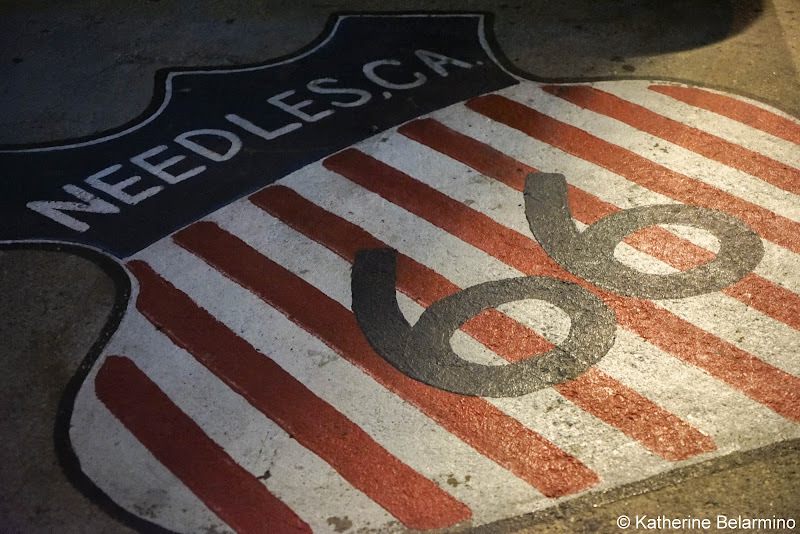 While we drove Route 66, we visited a number of California’s Route 66 road trip attractions along the way. If you’ve seen the Disney / Pixar movie Cars, you probably remember the Cozy Cone Motel, a motel along Route 66 with accommodations in what looked like upside-down cones. The Cozy Cone Motel was modeled after the Wigwam Motels that used to be found along Route 66. Wigwam Motels were the brainchild of Frank Redford, who built the first Wigwam Village in 1934 in Kentucky. The villages consisted of cabins built in the style of teepees surrounding a larger teepee building which housed reception. He patented the design and a total of seven wigwam villages were constructed in the United States, some as franchises, and some which he built himself, including the one in Rialto / San Bernardino. Today, three of these Wigwam Villages remain, two of which are along Route 66 and one of which is in California. 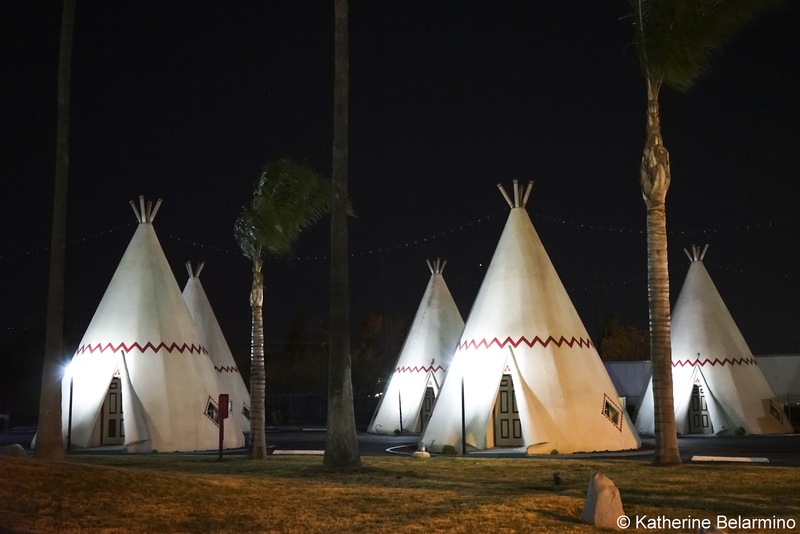 The three remaining are now on the National Register of Historic Places, and the one in Rialto / San Bernardino was added in 2012 as Wigwam Village #7. Travelers can still spend the night in one of the Wigwam Motel’s teepee cabins today. After heading north from San Bernardino along Highway 15, we reached the first real long stretch of Route 66 in California. When you hit Victorville, take exit 153B for E Street and head north. You’ll pass some industrial plants and then it is open road. Along this piece of Route 66 the iconic Route 66 sign is painted on the road at various intervals. There are a handful of small Route 66 towns along the way including Oro Grande, Helendale, Hodge, and Lenwood. 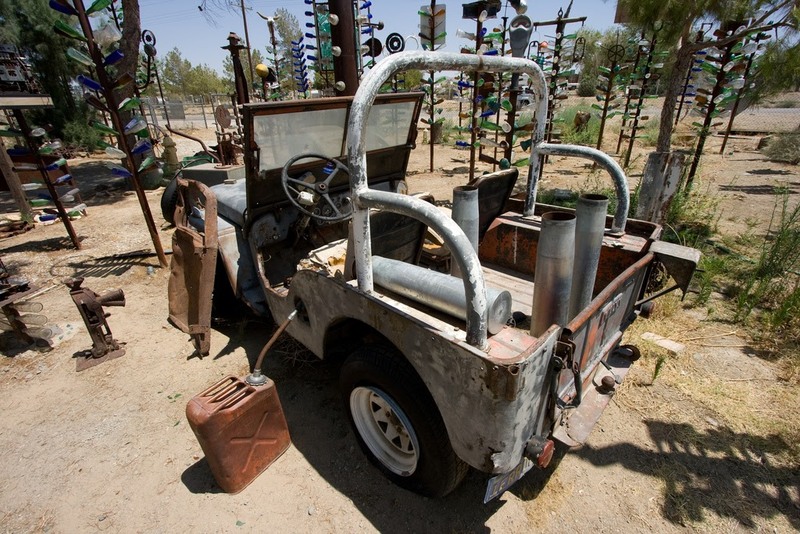 You can stop at Elmer’s Bottle Tree Ranch, an art installation of metal “trees” decorated with countless bottles. After Lenwood, Route 66 turns into Barstow’s Main Street, one of the last remaining Route 66 main streets in the United States. 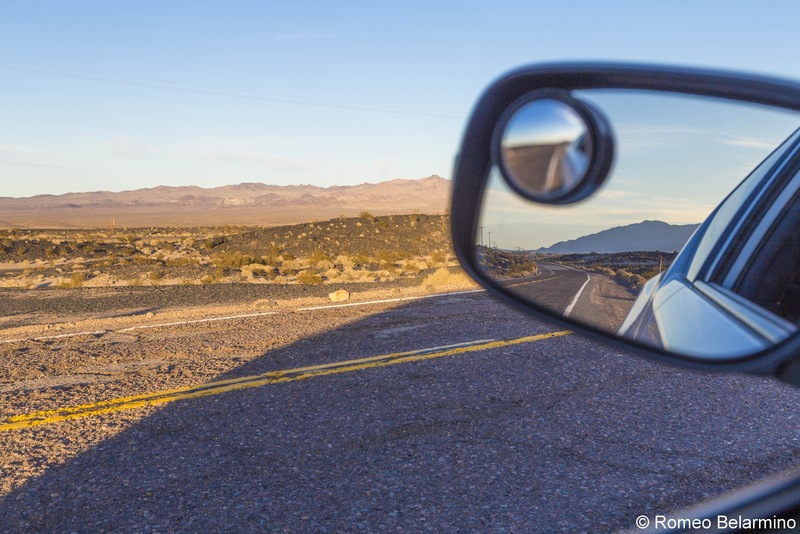 After seeing what there is to see in Barstow, Route 66, also known as the National Trails Highway, runs parallel along Highway 40 and enters the small town of Daggett. Here we took a detour up to Calico Ghost Town. On the way, we stopped at Peggy Sue’s 50’s Diner in Yermo for a tuna melt and a real chocolate milk shake so thick that your cheeks get sucked in when you try to take your first sip through the straw. 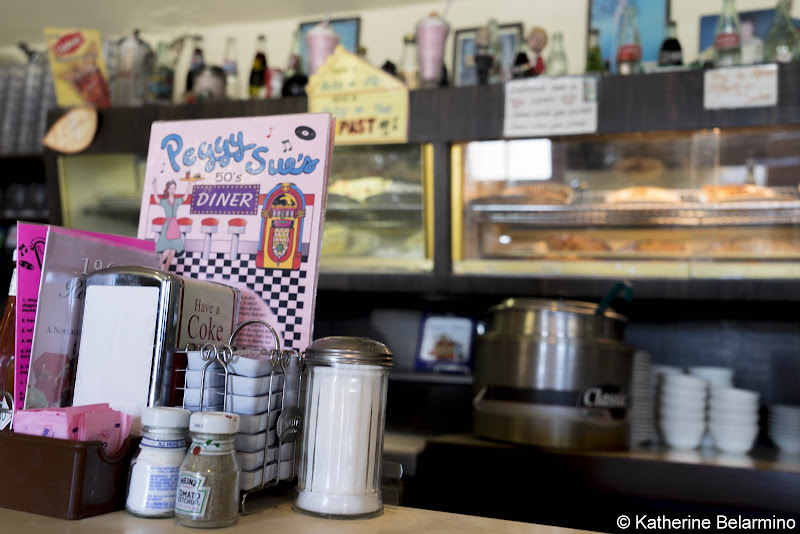 Peggy Sue’s is an original roadside diner that was built in 1954. During the days of Route 66, it had nine stools at the counter and three booths. Peggy Sue’s was restored and reopened in 1987. You can still sit at a stool at the counter, dine in one of the dining rooms, or even get your food to go and sit in the Dinersaur Park out back, where you’ll be surrounded by dinosaurs and serenaded with music being played over the loudspeaker that will make you feel like you’re at a sock hop. The Dinersaur Park is dog-friendly. Just north of the diner is Calico Ghost Town. You’ll see Calico spelled out in white rocks on the hillside. 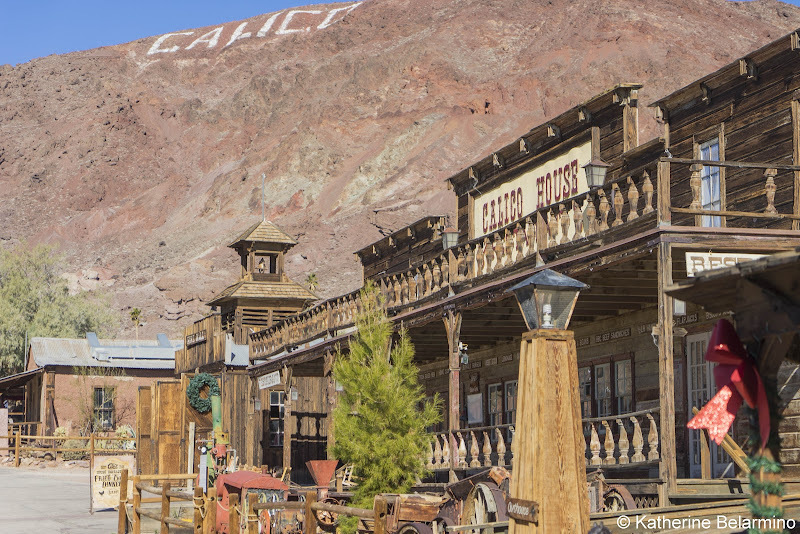 The mining town of Calico was founded in 1881 during the largest silver strike in California. The population peaked at 3,000 residents. Calico had 500 mines and produced millions of dollars’ worth of silver and borax in a little over a decade. But then silver lost its value and it cost more to extract the silver than it was worth. Calico and its mines were abandoned and it had become a ghost town by 1907. Walter Knott, known for Knott’s Berry Farm, purchased and restored Calico in 1951. He restored most of the buildings to look as they did when Calico was a mining town. There are a few buildings which he left in their original state: Lil’s Saloon, the Town Office, Lucy Lane’s House, the R&D Co. Store, and the General Store. Calico Ghost Town was donated to San Bernardino in 1966 and it was declared a State Historical Landmark in 1973 and proclaimed California’s Silver Rush Ghost Town in 2005. 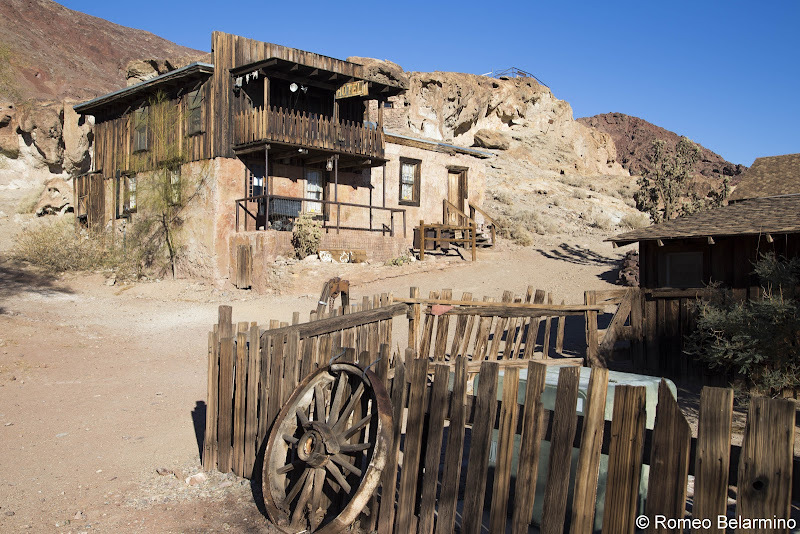 Calico Ghost Town is a large attraction and can take a few hours to visit. In addition to the historical buildings and shops, there are amusement park style attractions as well, which are run by Calico Attractions. 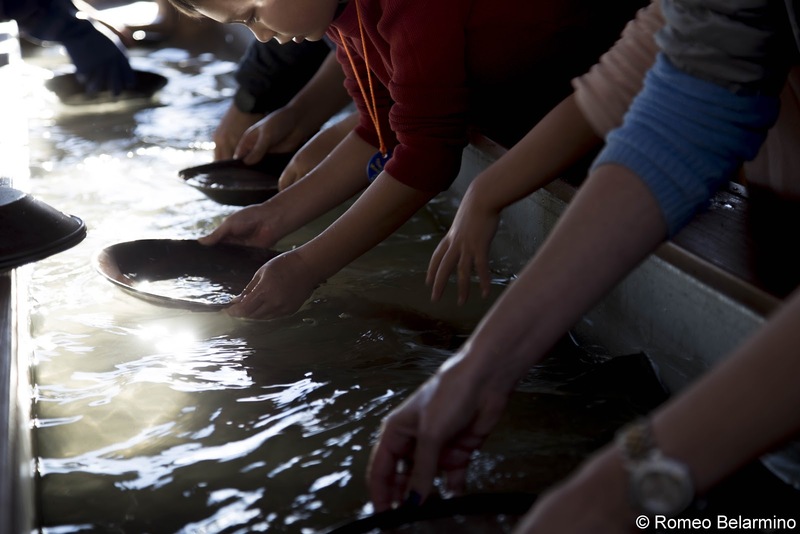 These include a walk through Maggie Mine, with recorded commentary and recreations, a ride on the Calico Odessa railroad, Gold Panning, and a visit to the Mystery Shack where water flows upwards and billiard balls roll uphill. The attractions are very similar to those we found at Goldfield Ghost Town while driving Arizona’s Apache Trail. 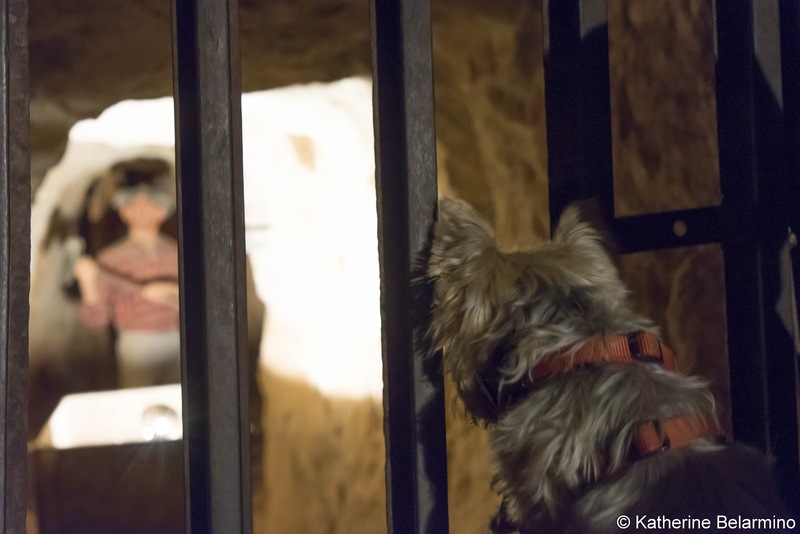 If your pets are coming with you on your Route 66 road trip, you’ll be happy to know that Calico Ghost Town and its attractions are dog-friendly. There’s even a shop in town that caters to pets. 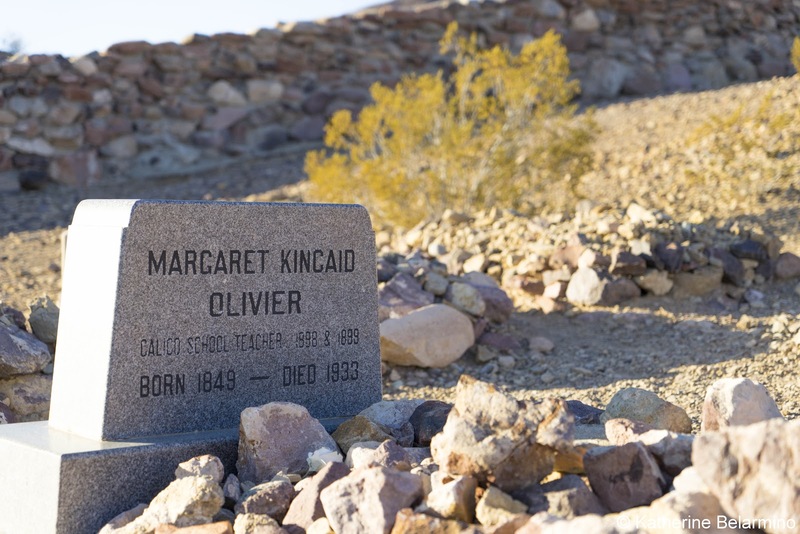 On your way out of Calico Ghost Town, make a quick visit to the Calico Cemetery, where residents of the old mining town are buried, including Calico's last school teacher, Margaret Kincaid Olivier. Back on Route 66, our California Route 66 road trip continued east. 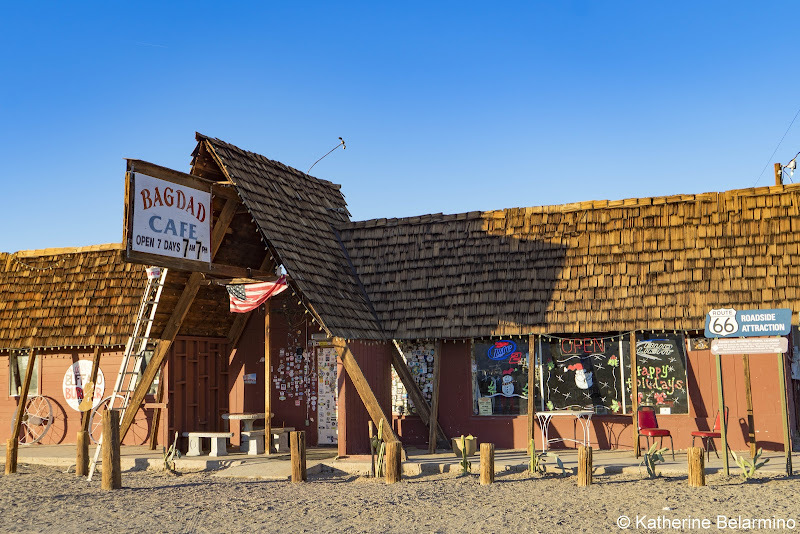 The first noteworthy Route 66 roadside attraction after Daggett is the Bagdad Café in Newberry Springs. The café was originally built in the 1950s. It became famous when the movie Bagdad Café was filmed at the café in 1987. At the time, the café was called the Sidewinder Café, but the name was changed after the success of the movie. Also in Newberry Springs is the abandoned Whiting Brothers gas station, which closed in 1968. The gas pumps are like ghosts of Route 66, still showing the price of gas at the time and the amount of the last sale. 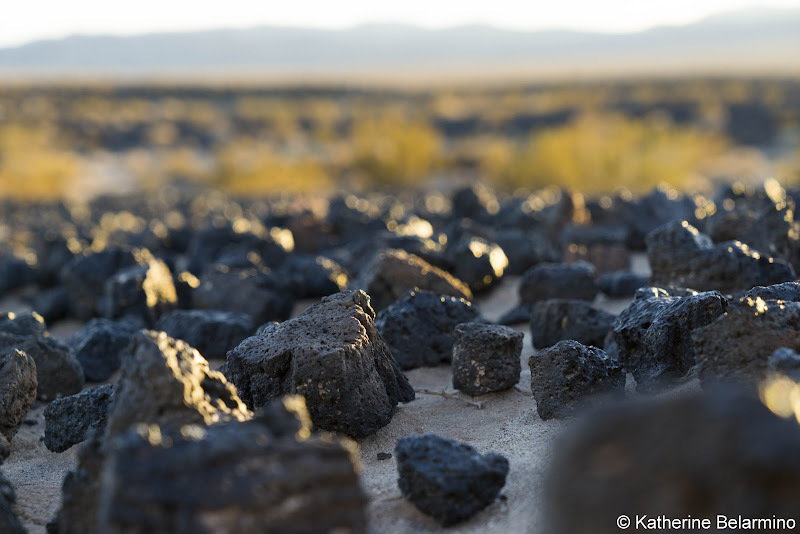 Something you probably wouldn’t notice if you were whizzing by on Highway 40 is the lava field in the middle of the Mojave Desert. Just south of Route 66 is Pisgah Crater, and the flat land around it is covered in lava rock. The road gets a little rough here, probably because there is no real need to keep it up because of its close proximity to the highway and the lack of towns. If the road is still rough when you drive it, consider getting on the freeway until you get to Ludlow. At Ludlow, Route 66 veers south, away from the highway. 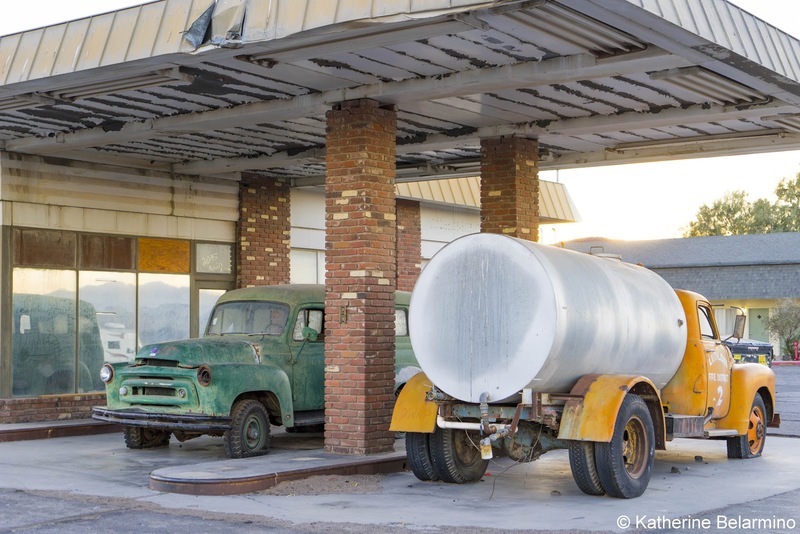 Ludlow was a popular Route 66 town, with its Ludlow Café, a motor hotel, and a gas station and garage. Now Ludlow is a Route 66 ghost town. There’s still a Ludlow Café, but everything else is pretty much ramshackle, including the abandoned and dilapidated Ludlow Mercantile Building near the railroad tracks. 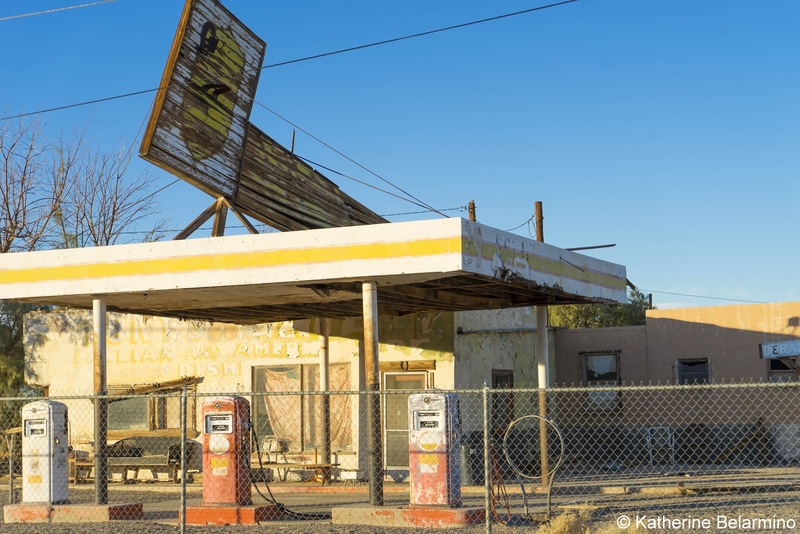 Along this next stretch of Route 66 are more remnants of what used to be, like the towns of Siberia, Bagdad, and Amboy. 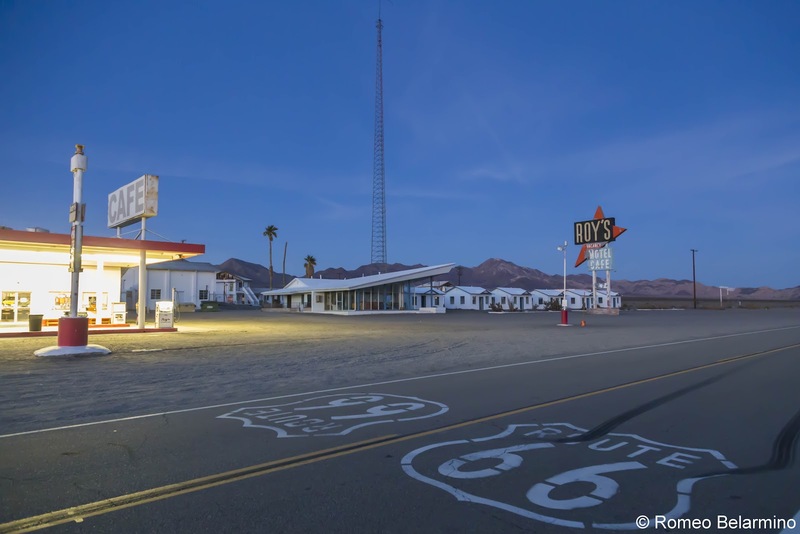 Along the side of the road in Amboy is Roy’s Café and Motel, which is one of the best-preserved Route 66 structures left in California. While driving through Amboy, you can take a detour and visit Amboy Crater, a volcanic cinder cone surrounded by miles of lava. Route 66 curves back up towards Highway 40, crosses the freeway at the town of Fenner, and continues north through the town of Goffe. Route 66 turns back south and terminates at Highway 40, which leads to the last Route 66 town of California, Needles. Taking a California Route 66 road trip is a fun and nostalgic way to travel, though it’s sad seeing the remains of the towns that used to be. Perhaps Route 66 road trips will become a popular way to see the United States again, especially for those who enjoy the journey as much as the destination. Thank you to Calico Ghost Town and Calico Attractions for hosting part of our California Route 66 road trip and making this post possible. As always, all opinions are my own.